We had a lovely evening with my friend Christine and her daughter Caitlyn. 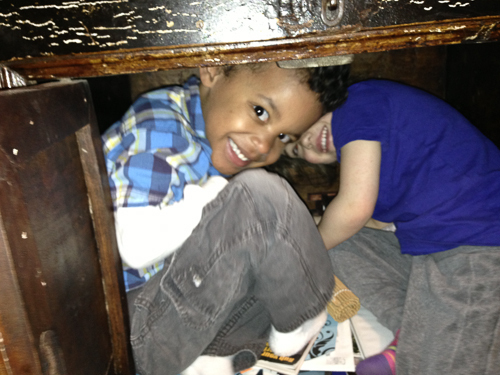 While Miles and Caitlyn made a mess of the house – to include playing hide-and-seek in my credenza from Korea – Christine and I made a little progress on some sewing projects. Christine is in the market for a new serger, and since I love mine, I convinced her to give mine a whirl. She made a super cute top for one of Caitlyn’s dolls. And let me just tell you how selfish a sewer I am. I don’t make Miles anything. Haven’t since his baby quilt in 2009. And Christine here is in the middle of making lots of super cute stuff for her kids AND their dolls. I spent most of the evening slicing up 4″ cuts of fabric into triangles. 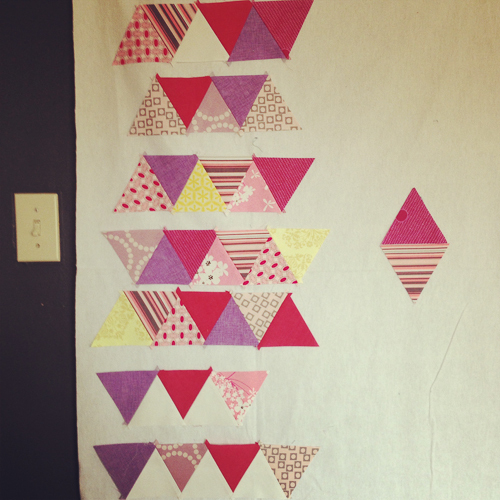 Using the fabric stack I pulled earlier, I started cutting the triangles. What a process. It took me a lot longer than I thought to cut these things. A. Lot. I made stacks of triangles by value order and then arranged them up on my design wall. I added 4 yellow triangles just to break up the pinks and purples that dominate most of the design. Keeping in mind the lessons I learned from Kari, I tried to keep some definite contrast between the triangles and less contrast in others. I stitched them in record time (it seems!). I’ll play with the design for a bit and see where it ends up. I’m envisioning a lot of white space. And a polka dot border. Omigah. I would love to comment on how beautifully that triangle top is coming along but I’m so distracted by that cuteness hiding in the credenza!! Adorable. Love triangle quilts! I made a pink one last month–my first pink quilt. I like your layout so far! I love the way the triangles are looking! The quilt is looking great! And I’m seriously blushing. I had a lot of fun giving that talk, once I got over being so nervous. I’m thrilled that you got so much out of it!